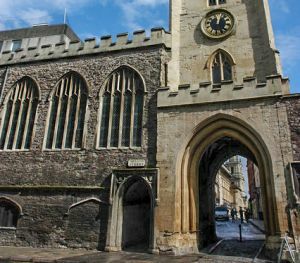 A medieval gem in the middle of modern Bristol, St John's was one of five churches built into the old city walls as a combination of spiritual refuge and defensive structure. It was intended as a place for travellers to say prayers before setting off on a journey - a reminder that travel in the medieval period could be a perilous exercise. The other four churches have long gone, but St John's still stands and incorporates the city's North Gate into the lower courses of its west tower. The central gate through the wall is flanked by a pair of smaller pedestrian gates added in 1828. There was a church on this site as early as AD 1100, but that 12th-century church was rebuilt in the late 14th century, at a time when the city of Bristol was one of the wealthiest trading centres in England. It was founded by a successful local merchant named Walter Frampton, three times Mayor of Bristol. The ornately decorated monument to Frampton, who died in 1388, stands within the church he built. His effigy is shown supported by angels, his hands held in prayer, while along the base of the tomb runs a series of heraldic shields. The inscription in Latin translates as 'Here lies Walter Frampton, founder of this church who died in the year 1388'. Across from the Frampton tomb is a memorial brass to Thomas Rowley (d. 1478) and his wife (d. 1470). A wealth of other monuments, including many from Bristol's 14th-century mercantile heyday, are in the chancel and the underground crypt that lies beneath it. The crypt is an atmospheric space, with a vaulted ceiling decorated by carved bosses. Look for the alabaster table tomb of a wealthy merchant and his wife, with figures of the couple's ten children at the base of the tomb. Much of the interior furnishings are 17th and 18th century, though the pulpit is a beautifully carved piece of 15th-century craftsmanship. The nave pews are made of oak carved in 1621. The west gallery was erected in the late 17th century and relocated further west when an organ was installed in 1883. On the east face of the gallery are 7 painted panels of saints. The font dates to 1624. One amusing historical touch is provided by a fountain to the north of the church. This is fed from a medieval conduit pipe used as a water supply by the Carmelite friary on this site in the 14th century. In the past, politicians seeking to curry favour with the electorate were known to make the fountain run with wine instead of water. St John's is no longer in use for regular worship and is cared for by the Churches Conservation Trust. As of this writing, it is open daily by volunteers but it is a good idea to check the Trust website for current opening details before planning a visit.